During the summer I was asked to participate in a book project. That book was with Walter Foster Publishing and it is is due to be out in the spring. (I was able to preview a copy of it, by the way, and it is beautiful!). But while I was busily working on the paintings for that book (5 of them) I was also asked to work on one with the Artists Club. This coffee cup and donut was the painting that I completed for that project. 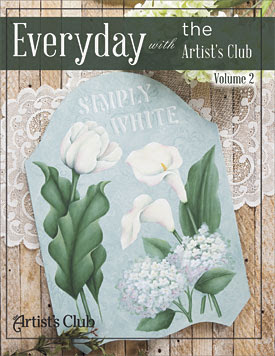 The Artist's Club book is now out, it is called "Everyday with the Artist's Club Volume 2. The book is a soft cover instruction book, containing 13 paintings with instructions of everyday designs (not seasonal) from various artists (one of which is me). It covers a wide range of painting styles and themes (mine, of course, is realism) and has 80 color pages. 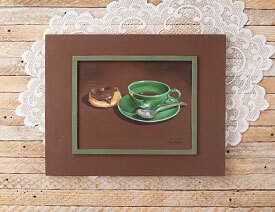 I am expecting copies to arrive in a few days (by February 13) so I have put the listing on my Etsy shop. If you order the book from me, it will be a signed copy and I will get it right out to you as soon as they arrive here.